Too bad the New Orleans Saints can’t play ’em all at home. They’re a 7-0 juggernaut in the Superdome but just 3-4 on the road after spotting St. Louis a three-touchdown lead in the first half of the Rams’ 27-16 victory on Sunday. There’s one more chance to get it right on unfamiliar turf, with the NFC South title on the line at Carolina next week. "The record doesn’t lie," quarterback Drew Brees said. "No excuses. We have to play better on the road and we will." A week after getting eliminated from playoff contention following consecutive road losses at San Francisco and Arizona, the Rams refused to sulk. St. Louis (6-8) showed improvement across the board. "It seems like when we play great teams we step up — like with the Seahawks and Saints, teams like that," defensive end Robert Quinn said. "It seems like we play up to the level; sometimes we play below the level we’re capable of. "We need to be more consistent." The Saints (10-4) are averaging 32.9 points at home, with five of their wins by double-digits, including against playoff hopefuls Dallas and Arizona. They’re averaging just 18.4 points on the road, with the three wins by eight, four and two points. They missed their first chance to clinch a playoff berth by a mile, making it look respectable with two touchdowns in the fourth quarter. "This is not a ‘show up on Sunday and play’ sport," offensive tackle Zack Strief said. "So, when you go on the field and put that on tape and play like we have on the road, it’s absolutely concerning." QUINN FACTOR: The defensive end had two sacks, a forced fumble, a fumble recovery, two quarterback hits, a tackle for loss and was disruptive enough to cause two penalties. 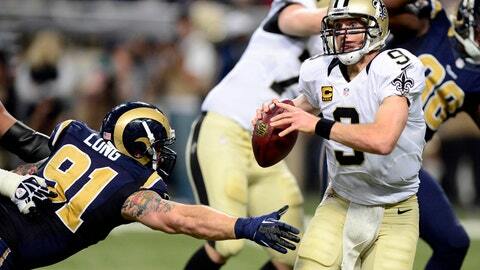 Fellow end Chris Long touted Quinn, who leads the NFC with 15 sacks, for defensive player of the year. Quinn played so well, the Saints benched Charlie Brown in the second half. "I saw enough. I saw enough. Period. I mean, enough," coach Sean Payton said. "At some point, you just can’t keep watching it. Feelings get hurt, that’s tough." SPECIAL TEAMS: The Rams practice the victory formation all the time and quarterback Kellen Clemens got a chance to kneel down after defensive tackle Michael Brockers blocked a 36-yard field goal attempt by Garrett Hartley with 2 seconds left in the half to protect a 24-3 cushion. "Coach has been preaching all season, `You big guys just get a little penetration and put your hand up,’" Brockers said. "That’s what I did." Earlier in the half, Greg Zuerlein and Stedman Bailey collaborated on a perfectly executed onside kick. Bailey’s leaping catch helped set up a field goal that put the Rams up 17-0. Hartley hooked a chip-shot field goal late that ended the Saints’ comeback bid and coach Sean Payton thought the trajectory was too low on both attempts. SECONDARY STEPS UP: The Rams’ defensive backs are green and appeared especially vulnerable to the Saints’ high-powered passing game with cornerback Janoris Jenkins questionable with a back injury. Brees was 39 for 56 for 393 yards but just one touchdown. The pass rush led by Quinn, who had two sacks, a forced fumble, a fumble recovery, two quarterback hits, a tackle for loss and caused two penalties, took the heat off the kids. Quinn’s hit on Brees led to T.J. McDonald’s first career interception on the Saints’ first snap. Tight end Jimmy Graham was held to two catches for 25 yards. Brees threw into triple coverage for Graham on his second pick by Trumaine Johnson, who snared an underthrown pass at the goal line. I AM HIP: Running back Zac Stacy needed assistance getting off the field after stumbling on pass protection in the first quarter, and shortly after leaving for medical tests the team said he had a hip injury and was questionable to return. Stacy returned after one play — Cory Harkey’s 31-yard touchdown pass from Kellen Clemens the play after McDonald’s interception — and set a franchise rookie record with 106 yards on 16 carries by the half. Stacy finished with 132 yards on 27 carries including a 40-yard touchdown run. "Questionable? Nah, I was never questionable," Stacy said. "I was always going back." HELPING HAND: The Saints were at the St. Louis 10 when Brees rolled out and missed badly on the pass intended for Graham. "That can’t happen. That’s on me," Brees said. Besides the interceptions, the Saints hurt themselves with five penalties for 64 yards in the first quarter. Late hits by Curtis Lofton and Malcolm Jenkins aided the Rams’ 93-yard drive capped by Lance Kendricks’ 4-yard touchdown catch for a 14-0 lead in the first quarter.